I finally am started to get my craft space organized and usable. 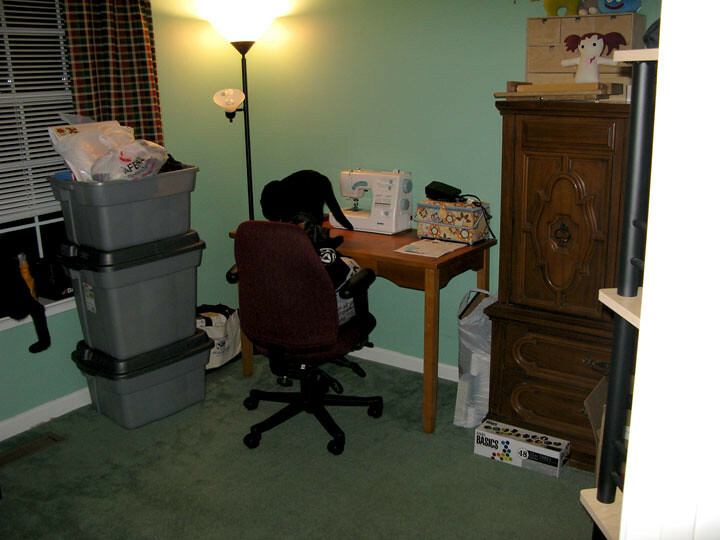 I actually had a "craft room" at my last place too, but it was more of a craft supply storage area. Early on I discovered that a futon and coffee table aren't the best of working spaces, at least for me. When I moved a few months ago, I once again had a room that was designated as my craft room. This space is a good deal larger, and already came with a small desk that I decided to make my sewing table (once I straightened things up). Up until a few weeks ago, this room was mostly serving as a storage area as well. That is until I got my new drafting table and chair. I've had a drafting table in my office at work forever, going unused. As we started cleaning out some of the old furniture, I asked about perhaps buying the table off the company. My boss told me to take it... for free. WINS! So my boyfriend and I picked it up one weekend. Once we got it into the condo, I needed to clean up and rearrange the craft room so I'd have a place for it. So not only did a get a drafting table for free, but as a result my craft room got cleaned up and turned into an actual usable space! There is still a good deal more work to be done to set things up really nice (painting, decorating, organizing), but its definitely a more usable space now. I was so excited, I took these pictures at night when I finished. As the space develops, I'll take better photos. Here is my new drawing/painting area. This was were I spent the majority of the last two weeks finishing up work for the Baby Canvases II show. 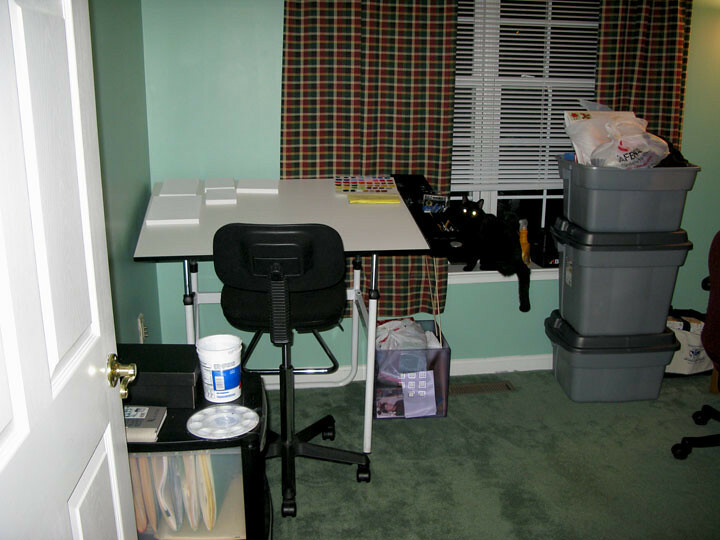 And this is my sewing area. You can see one of my helpers investigating the new set up. And this is the rest of the room/storage spaces. This is definitely the part that needs the most work. 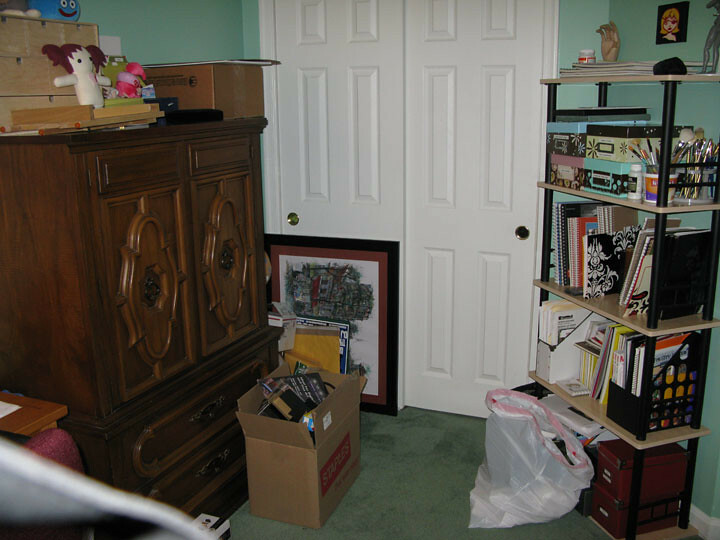 The closet space needs to be utilized better to make more room to put everything and get organized. Eventually everything will have its place. But mainly its nice to have a space to run away too and become completely absorbed in creating things.